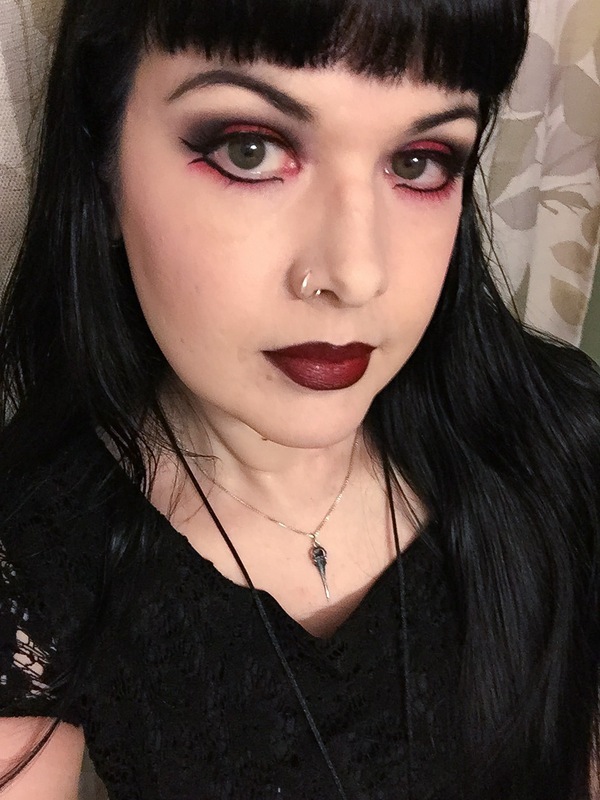 Last night was our local goth-industrial dance night and I decided to really do something interesting with my makeup, since I have been wearing lighter fare for the daytime regularly (taupe shadows and mauve lips have been my thing lately). I went all out last night and did a black and red theme I was really pleased with! Smashbox Photo Finish Primer, MAC Studio Fix Fluid NW10 applied with damp Beauty Blender, NARS Radiant Creamy Concealer underneath eyes with Beauty Blender, NYX HD Concealer in Porcelain to spot conceal and around the nose. NARS Light Reflecting Powder to set face, NYX HD Blush in Taupe to contour, Illamasqua Blush in Katie. Hummingbird skull pendant in sterling silver by Skeletos on Etsy – I cannot recommend this great jewelry artist enough! This entry was posted in beauty, beauty blog, beauty blogger, Makeup of the Day and tagged beauty, beauty blog, goth beauty, goth makeup, mac cosmetics, makeup, makeup geek, makeup of the day, NARS cosmetics, nyx cosmetics, red and black makeup, red eyeshadow, red lips, rimmel, sugarpill by Rachel. Bookmark the permalink.